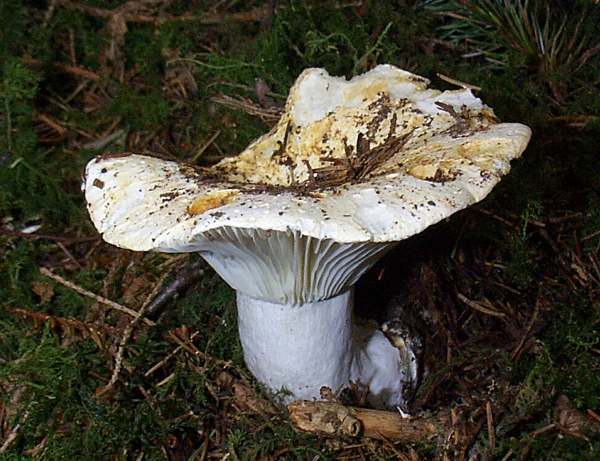 One of the largest mushrooms in the Russula genus, the Milk White Brittlegill Russula delica emerges from the earth pushing up pine needles, turf or leaf litter; hence, the large off-white cap is usually badly marked and often damaged. Russula chloroides is a very similar brittlegill (some consider it merely a variety of Russula delica) but usually somewhat smaller and in any case easily distinguished by a blue flush to its gills, most noticeably where they join the stem. The Fleecy Milkcap Lactarius vellereus is very similar in appearance to the Milk White Brittlegill Russula delica, and by far the easiest way to determine which you have found is to scratch a fingernail across the gills. As long as it is not an old, dried up specimen, copious white latex will be exuded from the damaged gills of the Fleecy Milkcap, while the Milk White Brittlegill will stubbornly refuse to part with any milk at all. Fairly common and widespread in woodland that contains broadleaf trees, Russula delica occurs throughout Britain and Ireland but is reported more frequently from regions of alkaline or neutral soil. On mainland Europe this brittlegill occurs from Scandinavia down to the Mediterranean countries. I have found no records of this species from North America, but a very similar brittlegill Russula brevipes is common across much of the USA. 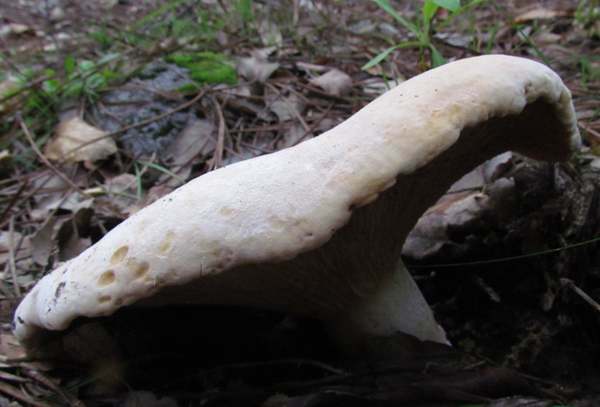 Russula delica is now commonly referred to as the Milk White Brittlegill, but some people still call it by its formerly popular common name the Milk-white Russula. 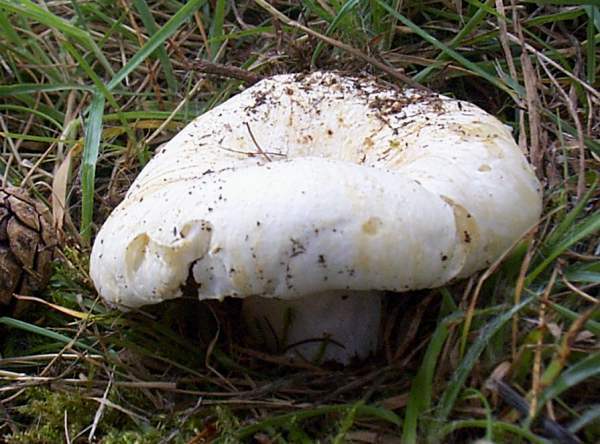 The currently-accepted scientific name of the Milk White Brittlegill was established in 1838, when Swedish mycologist Elias Magnus Fries described this species and gave it the binomial name Russula delica. Synonyms of Russula delica include Lactarius piperatus ß exsuccus Pers., Lactarius exsuccus (Pers.) W.G. Sm., and Russula flavispora Romagn. Russula, the generic name, means red or reddish, and indeed many of the brittlegills have red caps (but many more are not, and several of those that are usually red can also occur in a range of other colours!). The specific epithet delica means 'without milk', which may seem a little odd given that this is a characteristic of all Russula species. 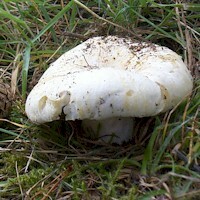 5 to 18cm in diameter, this fairly common mushroom resembles a milkcap in its development and general form. The cap is quite substantially expanded by the time that it emerges from the earth, and it pushes up soil and leaf litter that often marks the cap. Convex, with an inrolled margin until fully mature, the cap soon becomes funnel-shaped. 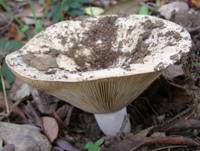 The dirty-white cap becomes pale yellowish-brown with age; its surface is matt and dry. Beneath the surface the flesh is white and does not change colour when cut. Narrow and moderately spaced or only slightly crowded, the brittle white or pale cream gills are decurrent. 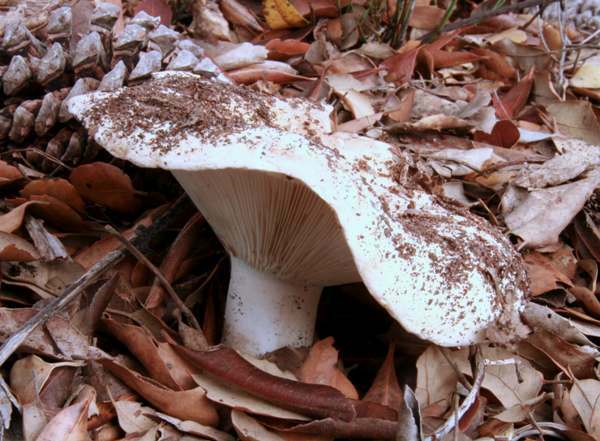 When damaged they release no milk - hence this species is classified as a Russula rather than Lactarius species. Unusually for a brittlegill, this species has some intermediate gills (gills that end partway between the stem and the cap rim). 2- 5cm in diameter, cylindrical, the short white stem is smooth; no stem ring. 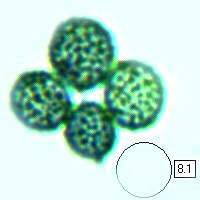 Ellipsoidal, 8-11 x 6.5-8.5µm, ornamented with warts to 0.75µm tall joined by many connecting lines forming an incomplete reticulum. 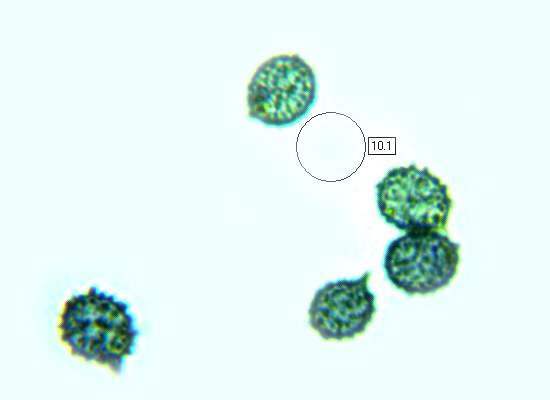 Faintly fishy or oily odour; very bitter and hot taste in the gills but fairly mild in the rest of the cap and stem flesh. Coniferous and broadleaf woodland. In common with other members of the Russulaceae, Russula delica is an ectomycorrhizal mushroom. Russula chloroides has more crowded gills and a faint bluish-green band around the top of the stem where the gills terminate. Lactarius piperatus is similar in appearance but its very crowded gills release a white latex when they are damaged. Although not considered poisonous, this mushroom has a poor flavour and is generally considered inedible or at least not worth collecting - which is a pity, because its size, widespread distribution and abundance would make the task of gathering enough for a feast very easy indeed.